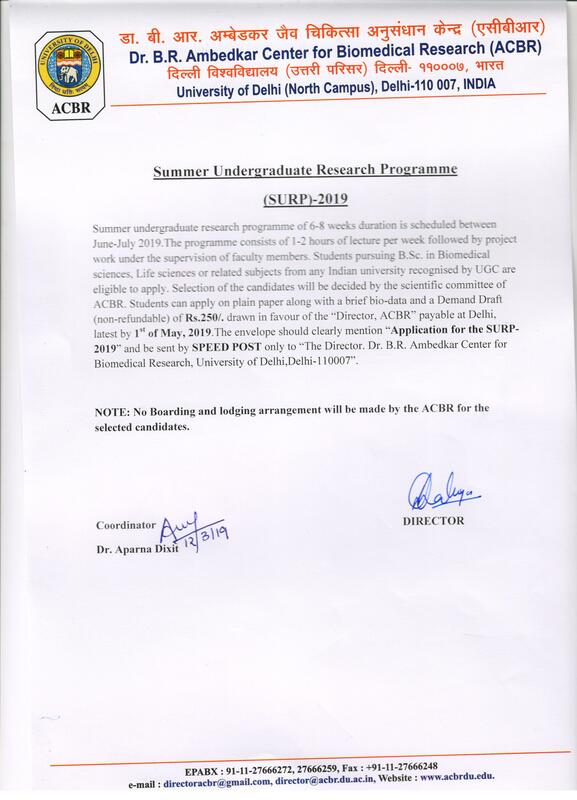 ACBR is organizing the Summer Undergraduate Research Program (SURP-2019) of 6 to 8 weeks duration to impart practical training in various newly emerging research techniques in the multi-disciplinary areas of biotechnology. Summer Undergraduate Research Program (SURP) is designed to enable college students with a strong interest in Biology/Chemistry to experience Laboratory Research from June to July every year. SURP trainees undergo a sound theoretical and quality analytical training in the various fields of biomedical science. The trainees choose a specific area of research and training in consultation with faculty and postdoctoral fellows. Motivational training is also provided to enhance their level of achievements, quality orientation and productivity. Summer Undergraduate Research Programme of 6-8 weeks duration is scheduled between June-July 2019. The Programme consists of 1-2 hours of lecture per week followed by Project Work under the supervision of faculty members. Students pursuing B.Sc. in Biomedical Sciences, Life Sciences or related Subjects from any Indian University recognized by UGC are eligible to apply. Selection of the Candidates will be decided by the Scientific Committee of ACBR. Students can apply on plain paper along with a brief Bio-Data and a Demand Draft (non-refundable) of Rs. 250/- drawn in favour of the “Director, ACBR” payable at Delhi, latest by 1st of May, 2019. The envelope should clearly mention “Application for SURP-2019” and be sent by SPEED POST only to “The Director, Dr. B.R. Ambedkar Center for Biomedical Research, University of Delhi, Delhi-110007”.